Janice Bissex and Liz Weiss, otherwise known as The Meal Makeover Moms, teach moms about how prepare nutritious foods for their families. They do so through their book (The Moms' Guide to Meal Makeovers), their website, and even a weekly podcast. 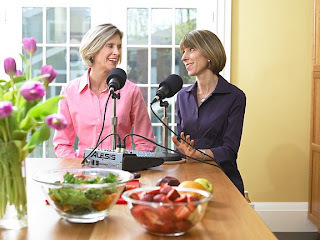 In this two part interview, the moms reveal what they do to make over meals, share how they became the Meal Makeover Moms, and provide some tricks for moms looking for ways to get their kids to eat healthful food. 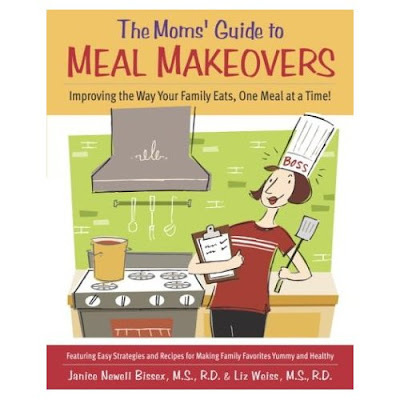 Leave a comment on part 1 or part 2 of this interview for a chance to win a copy of The Moms' Guide to Meal Makeovers! If you comment on each post, you will be entered twice! I will randomly draw two winners on Tuesday, August 19th. Janice and Liz doing one of their podcasts. What is a meal makeover? Liz: That’s a good question. Janice: It’s basically taking family favorite recipes and making them over to be healthier, kid-friendly, tasty, and easy to make. That’s what we do as the Meal Makeover Moms. That’s our goal. Liz: We know that families struggle to eat a healthy diet. So, as dieticians and moms, we’re not sitting here saying, “You need to eat a perfect diet.” What we’re saying is, “Eat your favorites, but make them healthier.” You’ve got to keep them kid-friendly and like Janice said, you've got to make them taste great because that’s the number one priority. Janice and I are both classically trained in the culinary arts, so we understand food. But, we also understand nutrition and that’s really the top priority because we know that kids don’t eat a healthy diet these days. We incorporate nutritious ingredients into everything we make. We don’t sneak them in, we incorporate them. How did you two end up working together and becoming the Meal Makeover Moms? Liz: I was working in Atlanta and I was a producer and reporter for the daily nutrition segment and the weekend program "On The Menu." It doesn’t air on CNN any more but this was back in 1987-1992 that I did that. I had a great experience there covering nutrition stories and food stories around the country. I was at a conference, at a breakfast meeting, and sitting at my table was Janice. She, it turns out, was working for the U.S. Senate in Washington, D.C., as their dietician, making sure that the dining rooms for the U.S. Senate had healthy offerings and working with the senators and their wives on getting rid of those big bellies, I guess. Janice, is that right? Liz: And you can’t reveal what John McCain ate or Ted Kennedy, or anything? Liz: I thought she had the coolest job and I wanted to interview her for CNN but they wouldn’t let us in. The White House doesn’t let you in. I don’t know why. Anyway, Janice and I just became friendly and when I moved back up to Boston, I looked her up. From there, we got to talking one day. She had kids, I had kids. I mean, years went by, and we were talking about how we can’t walk two feet on the playground without a mom stopping us and saying, “What do you give your kids for dinner? All my kids eat is mac n' cheese and Chicken Nuggets. I don’t know what to do.” This is back in the year 2000 or 2001 when obesity was just starting to make front page news - when the epidemic was really getting a lot of publicity. It was very apparent that kids were eating an abysmal diet and parents had absolutely no idea what to feed their children and the school lunch was really bad. I mean, they were selling the worst foods. This was before a lot of attention was paid to this. We just said, “My gosh, we’ve got to write a book,” because we were successful feeding our kids and we wanted to help other moms and dads. How long did it take to get the book written? Liz: It wasn’t really that long once we had a lunch together and really talked about it. Janice: And at first, I thought, “Oh, she’s out of her mind. I can’t imagine writing a book.” And then, I thought about it some more and said, “You know what? Maybe she’s on to something.” So, it took us probably a year. We wrote a proposal and got an agent and went to New York and met with publishers. It probably took a year to a year and a half of research and recipe testing and a lot of back and forth before the book was written. Liz: And then we launched mealmakeovermoms.com as a companion website. We really took our book and we married it with the site so that people didn’t just have the book as a resource, but they had the website where they could communicate with us. We get emails all the time. In fact, right before our call with you, I started crafting a response to a mom who emailed us about our podcast. We’re constantly reaching out, building our platform, and being a resource for parents. We get a lot of questions and we answer every single one of them personally. Janice: We started the blog about a year and a half ago, I’d say. Then, we started the podcast just a couple of months ago. So, we’re just sort of trying to expand our region - get our message out to more moms and dads and caregivers. Liz: We’ve got cooking videos on the website. We’re really trying to take advantage of what the Internet has to offer and all the new technologies. These bars are perfect as an on-the-go breakfast, lunch box snack, or dessert. Preheat the oven to 350°F. Lightly oil or coat an 8 x 8-inch baking pan with nonstick cooking spray and set aside. Place the oats, cereal, walnuts, dried fruit, cinnamon, and salt in a food processor and pulse until the mixture is finely chopped (the dried fruit should be the size of a dried pea or lentil). In a large bowl, whisk together the eggs, honey, and vanilla. Add the oatmeal mixture and chocolate chips and stir to combine. Transfer to the baking pan and flatten down gently with the back of a spoon or spatula to spread evenly. Bake 18 to 20 minutes until the edges turn golden brown and the bars are done. Let bars cool completely in pan before slicing and serving. TIP: These bars freeze really well. So, if you have leftovers, wrap individual portions in plastic baggies or aluminum foil and freeze. Do you each still have independent jobs outside of this? Janice: No. It’s a full time job. Liz: We do consulting work on the side, we write for magazines, and we’re doing consulting work with Mom’s Best Naturals, a cereal company. It’s really been a great partnership for us. We do recipe development for them; we’ve done some media work for them where we’re able to communicate with the public about the fact that there’s a lot of so-called healthy and natural products out there but they aren’t necessarily nutritious or affordable. The greatest thing about Mom’s Best Naturals cereals is they come in a family-size box and so you pay a lot less but you get more because they’re all whole grain (which is a huge thing for us) and very nutritious. They also take cereals kids love and give them a makeover, which is like what we do, by adding the whole grains. We’ve connected with them and we’ve got some really awesome recipes. In fact, I would say the hardest recipe we’ve ever developed was our Grab ‘n’ Go granola bar [see recipe to the right], a homemade granola bar. It took us like 10 tries. Talk about taste testing! We had a lot of neighborhood kids try it and we used Mom’s Best Naturals Shredded Wheat in that recipe and their oats. The other thing we love about them is it’s all about sustainability with that company. They use wind power to power the plant so the cereals are made from the energy from wind farms. They have a guy (we met him) who works for them on staff who actually is all about sustainability and reconfigured how they pack boxes so it’s more efficient when they are traveling around the country. It’s really cool stuff. When you created the recipes for the book, how did you divide the responsibilities? Liz: That’s a great question. We actually started doing stuff individually at home and we realized that was just not going to work because I would say to Janice, “Well, why don’t you do this?” And she’d say to me, “Why did you do that? How many did it serve?” And I’m like, “Well, in my family….” So we decided we’re going to do all recipe testing together. We’d sit down, we’d brainstorm, and then we’d get cooking. We rarely get it right the first time. We often will do 2 or 3 times, or 10 times in the case of those Grab n’ Go granola bars. But, it’s much better when we’re together. What we do is we sit down, type up the recipe, and Janice does nutrition analysis. She’s doing the math piece and I’m doing the writing piece. At that point, I’ll write a little intro, we’re sitting in the office together, and I’ll say, “Oh, how should I say…..” and we’d go back and forth. That’s where we divide and conquer, but together we do the cooking. Have you grown to be really close friends? Janice: When its 11:00 at night and I’m still working and we’re emailing back and forth, that’s really when I don’t like her very much at all. Liz: Yeah, the podcast getting edited. You have to edit that thing and that takes a while. Janice: But when we’re eating an avocado for lunch with olive oil, then it’s a little bit easier. It sounds awesome! :) Count me in. I'm obsessed with new granola and granola bar recipes. I can't wait to try this one. As the mom of four children ages 5 and under, this really appeals to me! Thanks, Stef! I've subscribed to their enewsletter and podcasts! I look forward to looking over their recipes. As a mom of 2 young picky eaters, this is perfect! And I got so excited to see the Mom's Naturals are available at Walmart! Easy peasy lemon squeezy! :) If I don't win a book, I'm definitely buying one! This sounds very interesting. My kids eat pretty healthy, as we belong to a CSA and get most of our food locally, so they tend to eat well, since they have a connection to the food and know where it comes from. However, there is always room for improvement and this looks like something that would be easy to implement. I'll have to check this book out - I'm getting ready to be a first time mom, and I know it's a struggle these days to get kids to eat healthy. I can use all hte help I can get! I have a 4 year old, who lives on air and a 21 month old who eats everything in sight. I will definitely have to check out the book. But not for kids, for my husband. We need all the help we can get...can't wait to see this book! Oh, yes. I need this! My kids are so picky! I can always use help on getting my children to try new things.